One of my favourite past times whilst watching a good movie is to munch on a packet or two of crisps washed down with a beer (or two). These crisps were produced and very kindly sent to us by Fairfields Farm Crisps in Colchester. 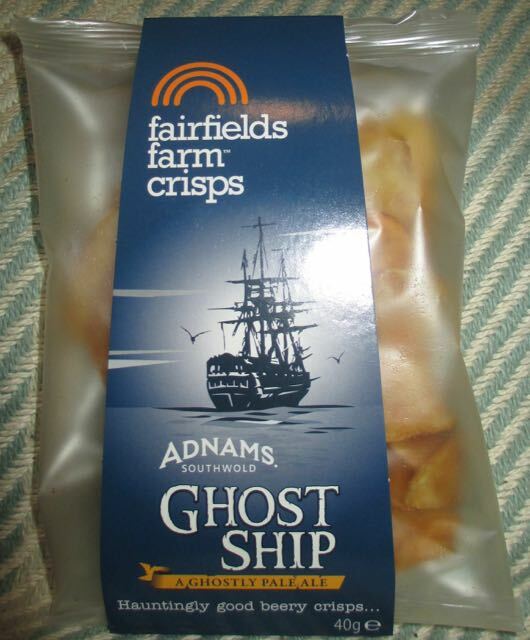 They are flavoured with the spooky sounding Ghost Ship Pale Ale from Adnams brewery. The beer was inspired by the ghostly wrecks of smuggler's ships along the south coast. These crisps were created from potatoes which were grown and cooked on Fairfields’ farm. The packet recommends eating them with a pint of beer, which is exactly what I planned to do (especially as Fairfields farm very kindly sent me several packets). I prefer my ‘beer, crisps and movie time' (just named it, though it’s not very catchy) to have subtly flavoured crisps in order to complement and draw out the flavours from the beer rather than drown out the beer with a strong crisps flavour. Ready Salted crisps or No Salt crisps work very well, as do slightly sturdier flavoured crisps such as Salt and Vinegar or Sea Salt and Black Pepper. 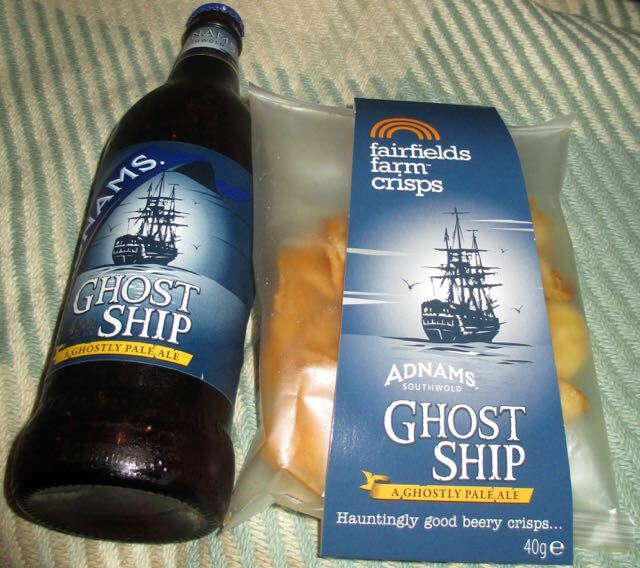 Therefore these Adnams Ghost Ship pale ale flavoured crisps seemed like the perfect treat. I cracked open a bottle of 4.5% volume Ghost Ship Pale Ale, (of which I picked up from Waitrose to eat with these crisps, although I understand that it is not necessarily mandatory) put on the Ladykillers (1955, with Alec Guinness and Peter Sellers) on the box, and dumped a couple of bags of Ghost Ship crisps into a bowl. On opening each packet there was a subtle lightly salted and citrus smell mixed with the cooked crisps. These crisps had a decent crunch with an initial mild barley flavour that mixed well with the rye. These crisps were perfect with my pint of spooky pale ale. The lightly flavoured crisps drew out the bitter citrus punch the beer gave on first taste which smoothed out into a malted barley aftertaste. Both crisps and beer were perfect with the creepy old robbery and murder movie that I watched with them.